Hello, my fellow fitness friends! I trust everyone is enjoying the beautiful fall weather and having great success with your health and fitness routines! I always hate to see summer pass, yet love the cooler temps and slipping into the jeans and sweatshirts. It’s all good! In this month’s newsletter, I wanted to broach a subject that I think merits mentioning. It’s something I still can’t believe I see in the gym: people who come in only to do cardio and a machine or two and completely neglect a total strength training regimen strength training regimen. Now this seems to be mostly women; however, I do see a few men who are guilty of the same thing. How can I convince you that the very thing that can turn your fitness goals from frustratingly fruitless to supremely successful is including regular and consistent strength training as part of your plan? While cardiovascular exercise is an absolutely essential part of a fitness routine, it is only part of the plan. You must strength train in order to achieve complete fitness. There are myriad reasons to strength train and the benefits are crazy important. Strength training increases your metabolism because the more lean and conditioned muscle mass you have the higher your metabolism. That’s because it takes two to three times more calories to maintain a pound of muscle than it does to maintain a pound of fat. In fact, it is a complete myth and an unfounded fear that unfortunately keeps many women from strength training and lifting weights. So let me pleeeeeeeeeeze clear this up here and now. Women do not need to worry about getting big muscles like men. The reason men get big is because of their high levels of testosterone. Just ask any professional female bodybuilder. Your fears will quickly be allayed. They work their patooties off for their size and they spend hours upon hours training, and eating special diets, and taking supplements upon supplements, and doing all kinds of crazy things to get the physique and muscle mass that they have. They also have to get their body fat way, way, way, down much below a healthy level to show all their muscle and definition. And that is super-difficult and practically impossible to do. And did I mention it takes testosterone to get those huge muscles they have? So, the really huge girls are probably getting a little supplementation somewhere resembling testosterone, if you know what I mean. But you didn’t hear that from me. I don’t mean to minimize the hours of hard work they spend training, but I think you get the gist. So, no worries. Regular strength training and a healthy nutrition plan will mostly sculpt and tone your muscle. Whatever size you do put on will look gawgous dawling and will be hard-earned. Trust me. Besides toned and defined is IN, baby! A little muscle is an envied look these days! Even on the ladies! For more info on strength training go to straightforwardfitness.com and for more descriptions and start and finish photos of some great strength training exercises go to compound and isolation exercise pages. It is a great FREE source of info, if I do say so myself. 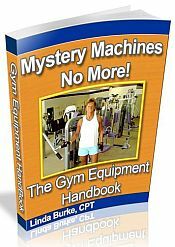 For an in depth look at machines and their proper use, you should go to the gym equipment guide page at straightforwardfitness.com. Hear this now: everybody needs to strength train every major muscle group on a regular and consistent basis! It truly is the magic bullet and the missing ingredient in your very own fountain of youth if there ever was one. You can always feel free to contact me for help with setting you up with a well-structured workout. ANNOUNCEMENT: I have a new weekly Fitness Column in the SunConnect that comes out every Wednesday. It's called "The Trainer's Edge" and aside from the crappy, oversized picture, which I have no control over, I am quite pleased and proud to have this opportunity to write and be heard. Please be sure and check it out and tell all your friends about it! Thanks so much!! For a video demonstration of this exercise, click here. Preparation: Hold dumbbells (palms in) and lie on bench in good body alignment (abs tight, chest up, back straight) with feet in comfortable position. Position arms perpendicular to the floor. Execution: In a controlled motion, keeping upper arms perpendicular to the floor, bend elbows to lower dumbbells until forearms are approximately parallel to the floor. While maintaining the controlled motion, return dumbbells to starting position. Contract triceps fully, without compromising form. Do not allow muscle to relax before next repetition. 1) Be sure to keep upper arm/elbow in tight and stationary as you lower the dumbbells. 2) You may place your feet on the bench for added protection for your lower back. 3) Go slow and controlled. 4) Pause at the top of the move before lowering the dumbbell. 5) Never sling the weight up (two seconds up) and go just as slow in lowering the weight (two seconds down). HEREIN LIES THE CHALLENGE: Always, always, always go slow and controlled! Remember form and technique trump heavy weights any day of the week, so keep this exercise light enough that you can execute perfect form. Choose a weight that makes the last two of 8-12 reps very challenging yet still doable in good form. This video once again brought a tear to my eye and a lump in my throat with its poignant message. Peter Gabriel Rocks!!! Take the time to read all the quotes and listen to this awesome song.